So here's the "runaway best-seller," etc, etc. It's not cheap and it's not short. More importantly to readers, it's not finished. Justin Cronin's 'The Passage' is certainly a compelling, makes-the-world-go-away success. But given that going in you already know that you're signing up for not one, but three books, the question any good reader is going to ask themselves is not, "Is this worth the money?" (It is, you easily get your entertainment dollar's worth and then some), but rather, "Is this a time investment I want to make?" And how can you detect from the first novel whether or not the whole shebang is going to be worth your time? The Question, then dials out to become more general. What makes a series of books satisfying; what makes it worth our while to slog, or rather sprint, through some 2,400 pages of world-building? For this reader, it is a synthesis of great character arcs that are keenly integrated with great set-pieces. We have to care about the characters in the story, to achieve some sympathy and liking of them, even if, in some cases, our like is a dislike, and what we're hoping for is a spectacularly messy ending. Character arcs are critical, because to truly enjoy reading about a fictional character in a series of novels, we want to see them change in a manner that is consistent with our own experiences, at least by extension. With luck, we're not going to see the end of the world, but it always feels like we're about to. Every time in history feels like the wind-up for the end-times. So in 'The Passage,' we want to see Amy and the other characters react to these end times in the way we hope we would react. But we want to feel that they are embarked on an exciting adventure as well, fraught with peril, some of which will decimate their numbers. We want death and we want it to matter to us as readers and to the characters we're reading about as well. 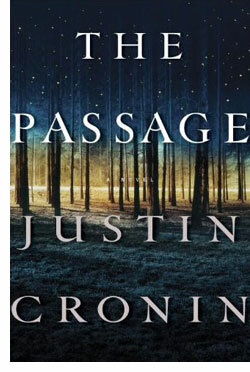 Having read the first part of Justin Cronin's trilogy, I can say with some confidence that he does indeed know how to create characters and character arcs that are involving and sufficiently rewarding to his readers, even when he's wiping out a huge portion of the world's population. In the first place, it's not really giving anything away to mention that partway through the book, he pretty much annihilates the population of the US, at least. He then invests time and attention to set up the aftermath, and it is the aftermath where most of the action takes place. He's clearly planning for the long run, and planning well. After a significant number of pages, we meet a whole new gallery of characters, and they all pan out well through lots of well-rendered adventures. On the big scale, Cronin shows that he can deliver a satisfying reading experience. The big scale is one thing, but he also has to deliver on an individual basis. This is where the action and real emotional rewards lay. There's a character we encounter very early in the narrative, and we really enjoy this character. Cronin does a superb job of misdirection, of keeping us focused on other pressing and rewarding characters, but offers late in the novel a superb set-piece that manages to encapsulate the appeal of this character. It certainly bodes well for the longer narrative. One proviso here is that this is not, so far, a very monsterific series. The monsters are present, and well-done, but gore and grotesquerie are not the focus. This will broaden the appeal for a larger segment of readers, but dampen it for others. There are some memorable monster scenes, but don't expect this to have the same monster density as say, a Neal Asher science fiction novel. That's not what Cronin is about. That said, these are not, and I can quote Cronin himself here, from our interview, "twinkling underwear model vampires." Indeed, one is compared at one point to a bloated tick. Give me some monster bloated ticks and people I can care about, I'm ready for the end of the world. I have to admit, though, that for the past forty years or so, I've been pretty well convinced that we have five years left. Now, I just hope that Cronin finishes his trilogy in the current end-time of five years, before the world finishes us all.